Achieve your product dosing goals with our custom-engineered material handling equipment and systems. 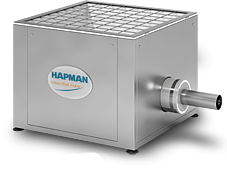 Hapman’s full line of gravimetric and volumetric screw feeders – including the PosiPortion™ Feeder, Screw Feeder, and Vac-Feeder – is engineered for industrial processing of dry material in either continuous or batching operations. 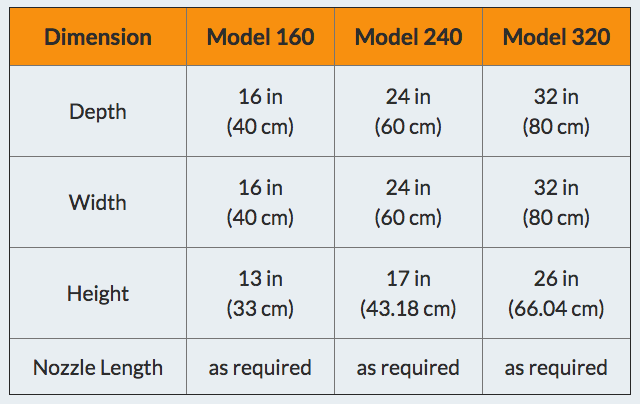 Whether you use the PosiPortion® or our U-trough Screw Feeders, both are designed to provide you with very precise product measurement from .084 CFH to 1,100 CFH. The PosiPortion® Feeder can be disassembled in minutes and the flexible hopper removed to provide for easy care and cleaning. The Feeders are designed with minimal moving parts and heavy-duty construction to ensure that you will have trouble free use for many years to come. Minimal degradation of your product is provided by the gentle feeding provided by the Hapman Feeders. The industrial gravimetric and volumetric screw feeders we manufacture are used in a wide range of bulk material handling applications. Whether your material is free-flowing – such as pellets and powders – or more difficult to move – such as pigments, fibers, and sticky or lumped material – we have the material handling equipment and experience to effectively and accurately meter your product. Precisely feed and measure free-flowing and sluggish bulk solids, granules and powders. Achieve superb volumetric performance through flexible hopper with steep side walls, large inside corners, and long throats to maximize natural in-flow while facilitating external agitation. Disassemble and clean easily with quick coupled components that maximize uptime (see video below). Satisfy more applications than any other feeder design. Maintain material quality without degradation, segregation or agglomeration. Versatile design provides discrete batches or operates continuously on a rate-controlled basis. 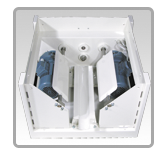 Start under heavy loads, making them ideal for installing beneath silos and large surge hoppers. Deliver premium enhanced performance (more automatic operation, validation and status monitoring is available through the simple addition of a scale and weight differential instrumentation). 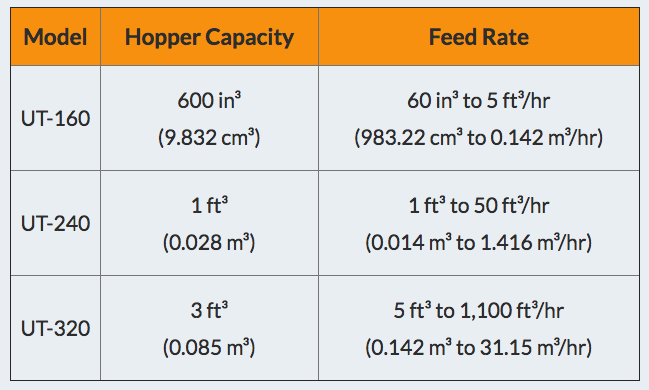 Warn you when hopper gets low so you can keep hopper full and keep feed rate consistent. 5-year limited warranty on flexible hopper. Handle and store hopper easily. Steel reinforcement molded into the flexible hopper flange enables the hopper to retain its shape and capacity when removed; even when full of product. Screw is quick-coupled, allowing the hopper to be removed in seconds. Unique design prevents decoupling when torque is applied. Get the strength and stability of structural tube-frame construction with the ability to support large hoppers or ancillary equipment. Optimize product flow with external paddle agitators that reduce bridging, limit material contact surfaces, reduce opportunity for contamination, and simplify cleaning. Choose from straight nozzles, T-nozzles, nozzles with a screw support bearing, and elongated distribution nozzles for a variety of metering, spreading and seasoning applications. Choose from many easy-to-change-out auger options to suit your exact need: flat, square, or round (with or without a center core), continuously welded, polished, or milled from solid bar stock. Increase holding capacity and extend time between refills with optional hopper extensions. 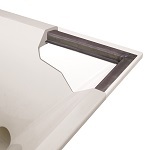 Minimize housekeeping and air quality problems with optional dust collection hood. Keeps material in process; makes work environment safer. Handle spreading and seasoning applications with optional elongated distribution nozzle. Ideal for feeding seasoning drums or distributing across moving conveyor belts. Use in coating drums, across moving conveyor belts or for filling wide surge hoppers. Alert your control system when material is getting low in the hopper. 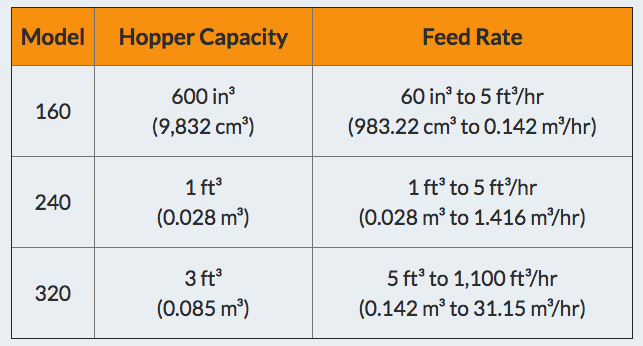 Optional level sensors help workers keep hopper full and feed rate consistent. Integrating load cells and instrumentation enables the equipment to perform more automatically, immediate feedback that material was delivered, and increased performance. Volumetric and gravimetric options are available. 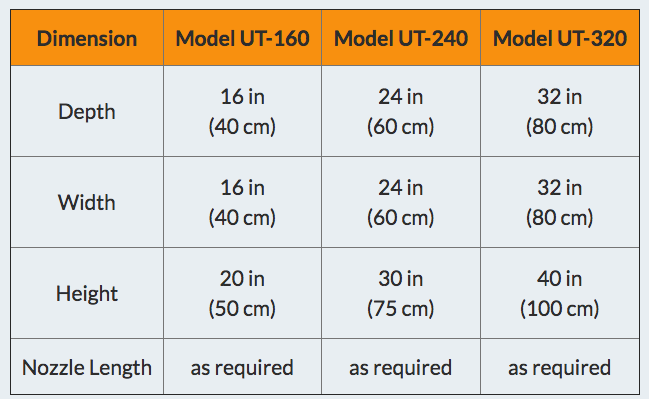 The best option for your process will be determined by the specific material used and unique details of your application. Precisely feed and measure free-flowing and non-free flowing bulk solids, granules and powders. Achieve superb volumetric performance through style, design, and a variety of agitation options. Robust design that will operate in harsh conditions and deliver material consistently regardless of material type. Can be slightly pressurized for purging. Also can operate where process is under pressure. Made of carbon steel, 304 stainless steel, 316 stainless steel or other special alloys. Deliver premium enhanced performance (more automatic operation validation and status monitoring is available through the simple addition of intuitive controls). Warn you when the hopper gets low so you can keep the hopper full and feed rate consistent. Our engineered Vac-Feeders are a unique combination of conveying, metered feeding, and dry/liquid combining equipment for small batch or low volume applications. 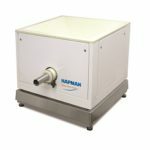 The Hapman Vac-Feeder was developed from an increasing industry need for a cost-effective method of unloading small batches of dry bulk material and pre-mixing the material into a solution. Typically, the low volume material handling applications were saddled with a labor-intensive, time-consuming process because the batch operation did not justify the cost of large capital equipment. Recognizing this growing trend, our engineering team worked with several customers to develop the optimal equipment for the job. 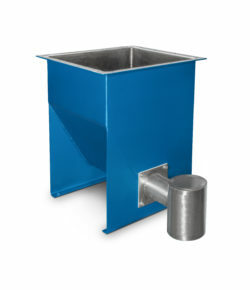 The Vac-Feeder has a small footprint, lower cost and is frame mounted. The Vac-Feeder operation begins with a special filtered vacuum conveyor that uses an electric motor to create suction. 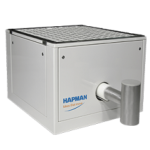 The vacuum conveyor comes with an integral filter for capturing material dust. The material is fed from the conveyor into the surge hopper of the feeder, which then accurately and precisely feeds material into an educator system which incorporates the dry material with the liquid. The operator can see the volume of material in the hopper at all times using a sight window that is integral to the hopper. The educator creates a venturi effect, pulling the dry material into the liquid stream, quickly combining the two. The system is engineered for accurately incorporating the two elements depending on the dry material volume, bulk density of the material, and type and volume of liquid introduction. 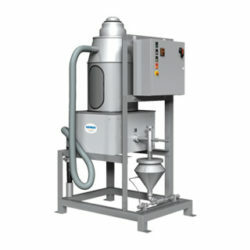 The Vac-Feeder is also available in a dry-only model. This unit is beneficial for small batch, dry conveying and feeding where no liquid introduction is needed. The dry-only Vac-Feeder offers the same cost and labor savings as the dry/liquid combining version, but without the educator. The metered dry material will feed directly into the process. Our applications experts will work with you to create the exact bulk material handling systems to meet your specific needs. PosiPortion™ Volumetric Screw Feeder/Seasoner – The equipment shown, engineered for an accurate +/- 1% metered dose based on volume and time, is specifically designed for seasoning drums or tumble coaters for snack food and candy manufacturers. Precision product dosing is measured by keeping the screw full and measuring the volume of material in the feeder coupled with turn speed, pitch of flights, and turning time. Model 321-SV – Equipped with a 304 stainless-steel distribution nozzle with 42″ projection and herringbone slot pattern. 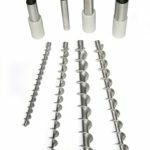 The dosing screw has a nominal outside diameter of 4″ standard pitch and a root diameter of 1″. Flow range estimated at 14-230 ft3/hr, approximately 172 ft3/hr @ 60 Hz based on free-flowing powders. Model 241-SV – Engineered for smaller batch operations designed with a nozzle OD of 1-1/2” with standard pitch and a root diameter of 3/8”. The capacity range of the 241-SV is approximately .88-14.2 ft3/hr or 10.6 ft3/hr @60 Hz based on free-flowing powders. The long throat design maximizes natural in-flow allowing for easy handling of difficult ingredients and compounds. Featuring a FDA hopper design and food grade finishes on all contact surface including the hopper interior, screw and nozzle. Bag Dump Station with Helix Flexible Screw Conveyor and Loss-in-Weight (Gravimetric) Screw Feeder – The system pictured uses the feeder as the control point, measuring and metering the flow of material based on a pre-set flow rates and minimum accumulation levels. When the reading on the scale drops below set-point, the Helix Flexible Screw Conveyor is called to feed additional material from the main hopper into the feeder hopper. The lighted alarm notifies workers when additional bags of material need to be emptied into the main hopper. The dump station with integral dust collector provides workers a safe and clean way to quickly empty bags into the hopper. The entire system is skid-mounted on casters for easy mobility throughout the plant. Volumetric PosiPortion Feeder With Bag Dump Station and Removable Self-Contained Dust Collector – The equipment shown consistently meters powders into a process on a volumetric basis. This use of the PosiPortion Feeder and Bag Dump Station is especially efficient in solving dust control/containment challenges in standalone feeder applications. 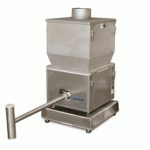 Stainless Steel PosiPortion Feeder With Hopper and Extended T-Nozzle – The equipment shown includes an extension hopper that is sized for quick refill and optimizing feed rate accuracy. An extended T-nozzle directs material to a process inlet, as well as a load cell. In conjunction with the PosiPortion feeder, the load cell provides the means for continuous weight-based feed rate control, ensuring the delivery of highly accurate batches by weight. Additionally, the load cell can be used to provide the net weight of material used in a process. Do You Have Feeder Questions?